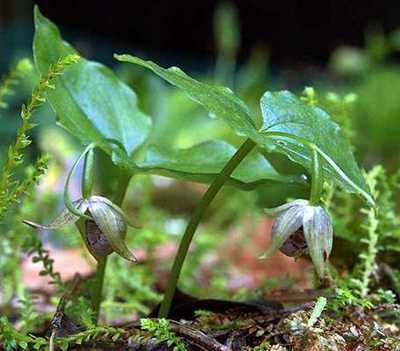 Cypripedium japonicum is a widespread terrestrial orchid species in Japan, found from all four of its main islands – Kyushu and Shikoku in the south, the largest island, Honshu, and Hokkaido in the north. In olden times massive colonies dotted mountain forests, each being literally thousands of flowering stems strong. Nowadays, colonies are far fewer in number and largely protected and cared for. 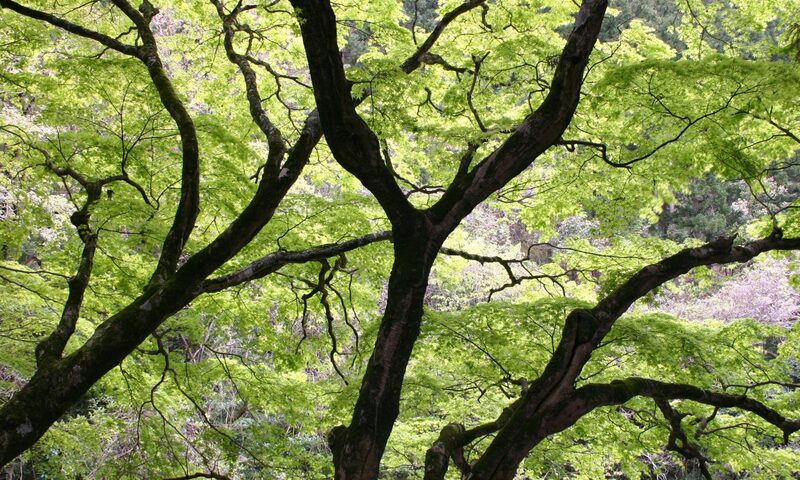 Out of all those innumerable plants that once graced the wet woods of Japan, a few were pure white flowers – the true alba variety of this species. A few still remain, but virtually all in cultivation these days. It is said that at least two known groups of this rare variety hail from Japan – one from the Nagano area of Honshu and the other from Shikoku. These alba plants are indistinguishable from the typical one except that the flower is completely free of any purple or pink coloring. They lack the anthocyanin pigments that normal flowers have in abundance. 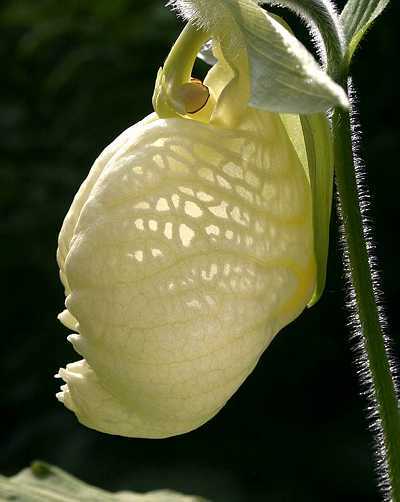 Back lit by the sun, the flower of Cypripedium japonicum alba reveals “windows” in the lip – a trick to lure trapped insects upward toward the stigmatic surface and thus pollinating the flower. Usually, I am not that drawn to true alba flowers, but in the case of this species, I take exception. 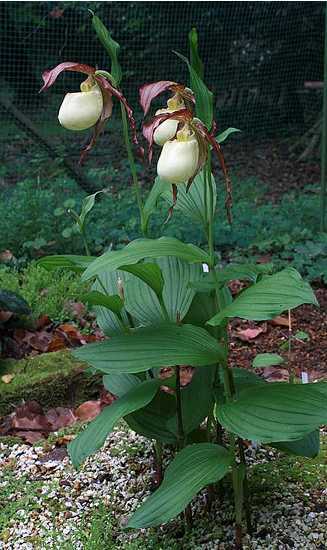 Without a doubt this is one of the most elegant white flowered Cypripediums in the world. As with many alba flowering plants, these do indeed seem to be weaker in cultivation that the normal type. In my experience they don’t hold up as well, being more given to rots. 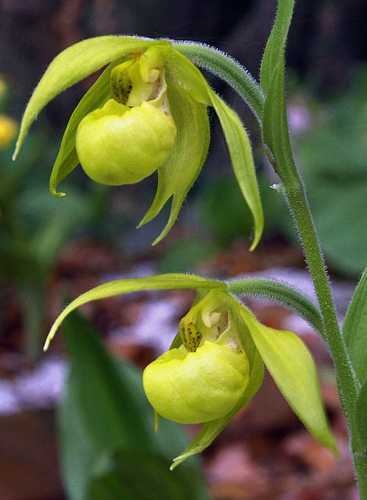 Beyond that, their requirements are the same as normal Cypripedium japonicum – a shady spot in the garden, a rich, humusy loam soil, and plenty of moisture year round. This species is completely intolerant of drying any time of the year. 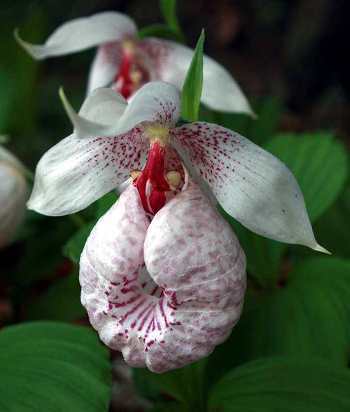 The same could be said for just about any Cypripedium, but with this one it is absolute – if you let them dry out, they will go dormant, weaken, and perhaps die. They are strong feeders, though I would fertilize only with annual addition of organic matter rather than inorganic salt based fertilizer, particularly if you are growing them in a highly organic compost to being with. It is all too easy to over fertilize terrestrial orchids, and they usually reward you by dying outright. 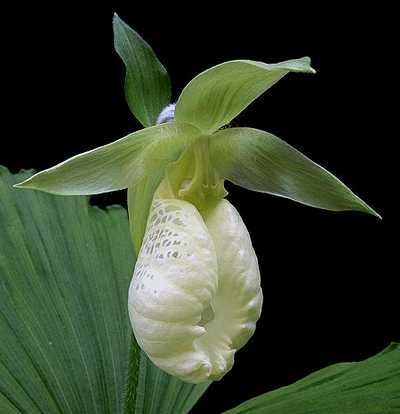 The flower of Cypripedium japonicum alba lacks any purple pigment altogether. 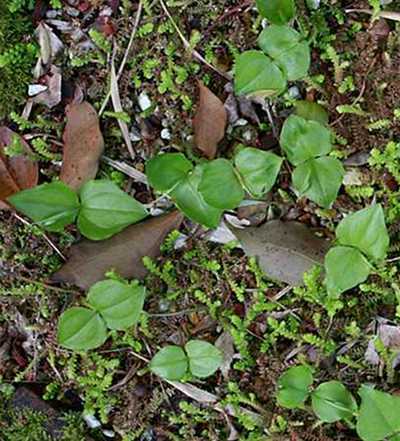 Northern and central Japan is home to one of the smallest Cypripedium species, C. debile. Both its Latin and Japanese names allude to this plant’s size – debile – meaning “frail” and koatsumorisou, meaning “small lady slipper”. While is this one won’t ever win a beauty contest, it is an amazing little orchid. Cypripedium debile is a dwarf herbaceous perennial orchid of moist woodlands. Like its larger cousin, C. japonicum, the two small nearly heart shaped leaves sit atop a short stem that is between 4-8 cm tall. The light green leaves are completely hairless, shiny, and smooth (glaucous). Their venation is simple and the leaf margins are slightly ruffled. Each one is between 3-6 cm long and about as wide. The thin, almost thread-like flower scape is short (2 cm or less) and hangs slightly downward from between the two leaves. The single floral bract is relatively long and grass-like, often longer than the flower stalk itself. A pair of flowering Cypripedium debile in the garden. Unfortunately, these are very difficult to maintain long term. Each year thousands are removed from the wild for the plant trade, and most are headed for their doom. The flower itself truly hangs downward such that the orifice of the lip is either facing strongly in a downward position or in some cases even can face the ground surface directly. The tiny flower is not much to see being only about 1.5-2 cm across. The oval lip is pinkish and lightly veined with purple on the outside, but strongly veined inside. It is obscured by the other flower parts which are very similar is size and shape: the dorsal sepal, the petals, and the synsepal. All are a light green color with slightly darker green veins throughout. The overall impression is a very shy flower that is hiding its little head between its knees. In nature these can form scattered, yet extensive colonies. The roots are few and short, reportedly growing between layers of leaf humus and are no more than 10 cm long. Plants can form two or three growths, but typically are found singly. 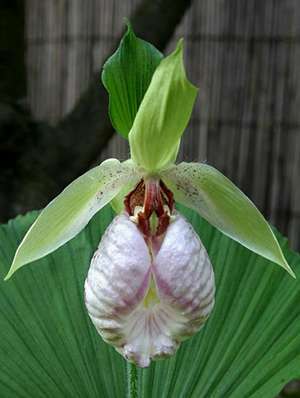 Cypripedium debile as seen from above. They really are small, and easily overlooked. I have been growing lady slipper orchids, genus Cypripedium (here after called Cyps), in a warm temperate climate for 7 years in southern Japan (latitude 34 N). In the spring, when the plants are emerging and flowering, I get a jolt of shear joy – mission accomplished. Then, in June, the monsoon rains kick in and the rotting begins. Bugs get more active and slugs are a constant threat. By late July (as I write this), I am positively sure that all is lost for the season since just about everything is worn, torn, ripped, rotted or eaten. The oven heat of August and September seems to only emphasize the point – growing Cyps in a hot summer climate is madness. Come November, with its cool rains and falling maple leaves, I dare to check the plants and am often surprised with what not only endured, but even grew well that year. The following article is the method I’ve worked out over the years to grow these lovely terrestrial orchids. Cypripedium kentuckiense growing in its 3rd season in a raised bed at the eves of a native woodland. First of all, let me explain the climate I’m working with. Kyushu, the southernmost main island of Japan, is a warm temperate climate sitting on the eves of the subtropics. A typical day in January has a high around 7 C (44.5 F) and a low of 2 C (35.6 F), with an daily average around 5 C (41 F). Why spend so much time worrying average temperatures? The reason is simple – to vernalize adequately (have a proper dormancy period), most Cyps require at least 3 months of an average temperature at or below 5 C. My town, situated just on the edge of a mountain range, barely fulfills that requirement. In fact, the average temperature is a bit warm in the winter months. If winter weren’t trouble enough, June and July create more problems. This is due to the inordinate rainfall of the summer monsoon. A meter or more of it can fall in just 6 weeks, something most Cyps don’t enjoy. In mid July the rains stop and the oven turns on. Average highs are in the low 30s C (90-92 F) with lows only down to the upper 20s C (80-82 F). Fall comes late, with October drying off and slowly cooling off, but the true colder nights don’t come until late November or early December. Cypripedium henryi is another potentially heat tolerant species that occurs in parts of SE Asia.